While serving as the lead battalion of the nation's Global Response Force, 1st Battalion, 505th Parachute Infantry Regiment was alerted in April of 2011 for deployment to Afghanistan in support of Operation Enduring Freedom and the Combined Joint Special Operations Task Force - Afghanistan. In late May 2011, the battalion deployed and distributed combat power across each Special Operations Task Force (SOTF) in country to execute Village Stability Operations in conjunction with Special Operations Forces from different services and partnered Afghan National Security Forces. The battalion conducted sustained combat operations for just over 9 months and completed their redeployment in early March 2012. 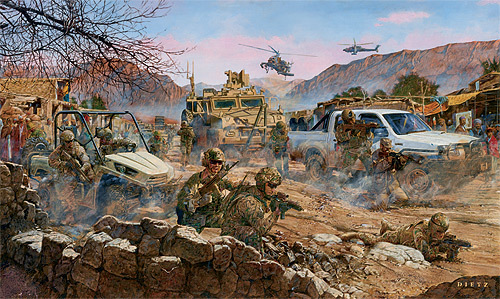 "Breaking the Paradigm" highlights the uniqueness of this deployment, where Special and Conventional Forces operated together under a single, tactical-level headquarters and excelled. Paratroopers, Green Berets, SEALs, and Afghan National Security Forces executed combat operations together as one team under the command of Task Force One Panther. Though some were concerned that the units could not function effectively together due to different cultures, they were proven wrong, and this is a direct reflection of each unit's ethos, adaptability, and focus on the mission first and foremost. The Paratroopers and Special Operations Forces quickly assimilated into an exceptional fighting force that leveraged one another's strengths. They lived amongst the population, met daily in shuras with key village elders to improve governance and development, captured or killed the enemy, developed Afghan Local Police, and fought with Afghan Commandos. Task Force One Panther stands as an example of our military's ability to quickly adapt to the circumstances of a conflict, organize to meet the operational challenges, and maintain a steadfast focus on accomplishing the mission. The print depicts a combined operation in rural Afghanistan. The mission is to deny Taliban influence in this village by establishing security in order to improve governance and facilitate development. The village elders support the development of ALP; however, the Taliban have not yet been entirely defeated. Task Force One Panther forces are supporting the Commandos in the execution of a clearing operation to enable the expansion of ALP. The patrol expects contact, and consequently, they are vigilant and move deliberately. They detect a threat and react quickly. If necessary, they will fight and bring to bear our most lethal and non-lethal capabilities in a precise manner. Regardless of the situation, they will execute as one hand - mailed fist or velvet glove. They have broken a paradigm that they were likely not even aware of and fought as one team that contributed immensely to the success of Operation Enduring Freedom. This print is dedicated to SSG Donald V. Stacy (B Company, 1st Battalion, 505th Parachute Infantry Regiment), SPC James A. Butz (Headquarters and Headquarters Company, 1st Battalion, 505th Parachute Infantry Regiment), and SFC Benjamin B. Wise (A Company, 3rd Battalion, 1st Special Forces Group), who each made the ultimate sacrifice for their country.